Wirnt von Gravenberg composed his Wigalois probably in the second decade of the 13th century. The hero of this German Arthurian romance of ca. 11,700 lines is Wigalois, son of Gawein (Gauvain) and the fairy Florie. Raised in isolation by his mother, he appears at Arthur’s court, twenty years later, in search of his father. Unlike the characters in the Old Frenche romances of Chrétien de Troyes, the creator of the genre, Wigalois is a hero without a crisis. A perfect knight from the start he undertakes a series of adventures in the Autre Monde to liberate the country Korntin from its oppressor Roaz, who has killed the rightful king Lar. Wigalois falls in love with his daugher Larie. Using three magical objects and with God’s help (who answers his prayers in hours of need), he manages to overcome his diabolic adversaries, becomes King of Korntin and marries Larie. The Leiden manuscript (LTK 537) is the oldest illustrated Wigalois codex that has survived. According to the colophon (fol. 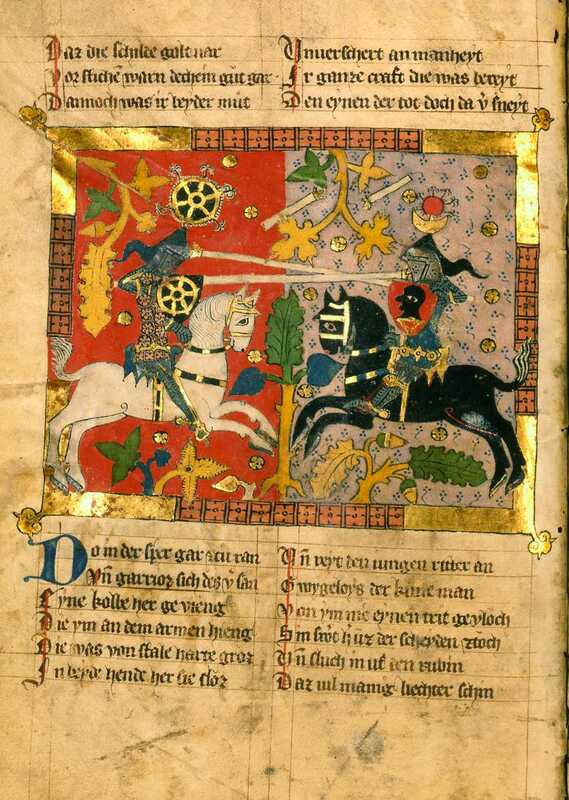 117v) it was written in 1372 by Jan von Brunswick, monk of the Cistercian abbey Amelungsborn in North-Germany, for Duke Albrecht II of Braunschweig-Grubenhagen. Perhaps the scribe was also responsable for the 47 half page and 2 full page miniatures. With their many exuberant colours and ‘naive’ composition they enhance the fairy-like atmosphere of the romance. The remarkable style, perhaps influenced by medieval tapestries, is clearly distinct from the contemporary Arthurian iconography, dominated by Parisian illuminators. The miniature on fol. 71v depicts the battle on horseback between Wigalois and the heathen dwarf Karrioz. Their lances are still unbroken, but a former clash has been depicted in the spear stumps above. The shield of Karrioz shows a moor’s head (which the text identifies as Mohammed), that of Wigalois a wheel (of fortune). Literature: I. Henderson, ‘Manuscript Illustrations as Generic Determinants in Wirnt von Gravenberg’s Wigalois’, in: H. Heinen & I. Henderson (eds. ), Genres in Medieval German Literature. Göppingen 1986, p. 59-73. — Wirnt von Grafenberg, Wigalois. Text and transl. J.M.N. Kaptein, S. Seelbach & U. Seelbach. Berlin 2005.